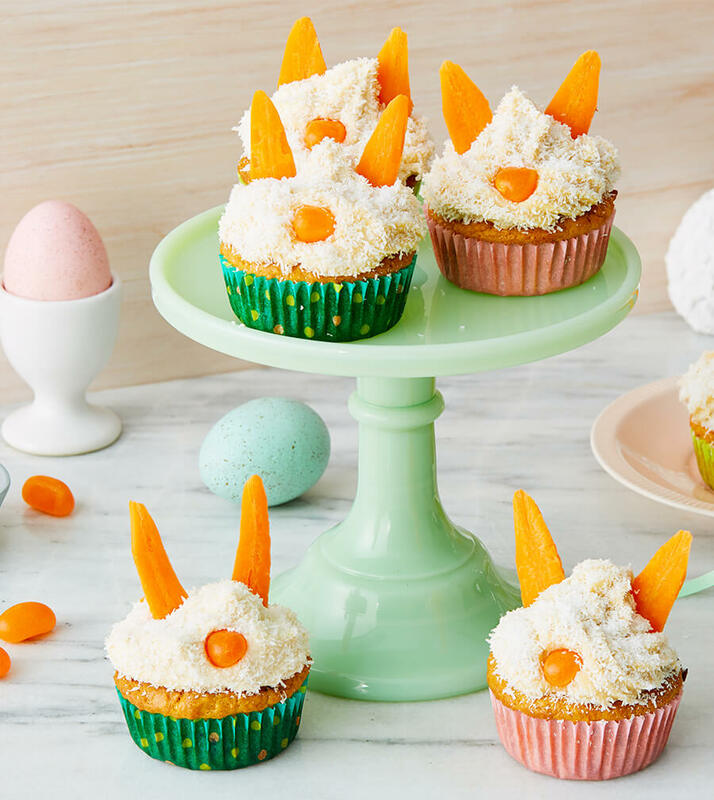 These cute muffins are the perfect healthy Easter treat. Preheat oven to 220°C and grease a 24-cup mini muffin pan. In a large mixing bowl, combine the flour, baking powder, cinnamon, baking soda, salt, ginger and nutmeg. Blend well with a whisk. In a separate, small bowl, toss the sultanas with 1 teaspoon flour so they don’t stick together. Add the grated carrots and floured sultanas to the other ingredients and stir to combine. Pour the wet ingredients into the dry and mix with a big spoon, just until combined (a few lumps are ok). Divide the batter evenly between the 24 muffin cups. Bake muffins for 15 minutes, or until the muffins are golden on top and a toothpick inserted into a muffin comes out clean. To make the icing beat cream cheese, butter, maple syrup and cinnamon with an electric beater until light and fluffy. Spread cream cheese mixture over cooled muffins. Cut the 12 jelly beans in half. Cut the baby carrots in half, both crossways and long ways to form bunny ears. Get the kids to help you add the carrot ears and jelly bean noses to the cupcakes.